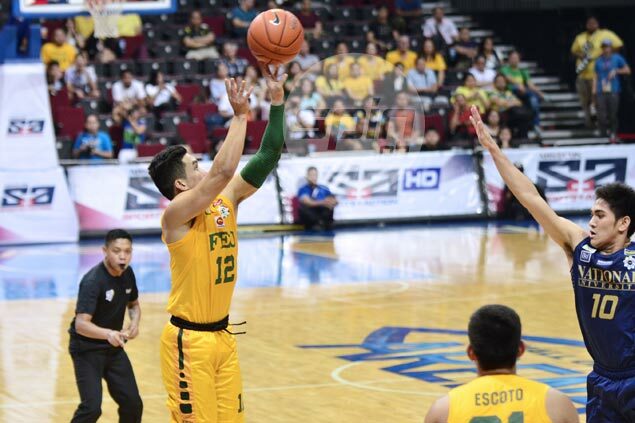 FAR Eastern University grabbed solo second place after beating National University, 78-75, on Wednesday in the UAAP Season 79 seniors basketball at the Mall of Asia Arena. The Tamaraws won their fourth straight game to improve their record to 5-2, two games behind league-leading La Salle (7-0) after the first round. Monbert Arong fired a career-high 20 points for the Tamaraws, who spoiled the efforts of Bulldogs gunner J-Jay Alejandro and his personal-best 31 markers. Wendell Comboy added 14 for the Tamaraws, who led by as many as 13. “We are within target. I think lahat ng teams, that’s the target, to get wins para maka-advance later. But it’s only the first round,” said FEU coach Nash Racela. After leading 66-53 early in the fourth, the Bulldogs mounted a comeback led by Alejandro and tied the game at 71 with an 18-5 run. But Ron Dennison and Richard Escoto hit crucial baskets down the stretch to keep FEU’s lead with only a minute left in the contest. Alfred Aroga had 14 points and 14 rebounds for the Bulldogs, who slipped to 4-3. FEU (78)—Arong 20, Comboy 14, Inigo 12, Escoto 10, Orizu 7, Trinidad 6, Dennison 5, Jose 4, Tuffin 0, Bayquin 0, Holmqvist 0, Ebona 0, Nunag 0. NU (75)—Alejandro 31, Aroga 14, Salem 9, Gallego 9, Salim 4, R. Diputado 2, Aquino 2, Mosqueda 2, Abatayo 0, Morido 0, C. Diputado 0, Sinclair 0, Rangel 0. Quarters: 17-14, 39-32, 59-50, 78-75.